Treasury is a broaden concept which can assume different shapes according to the context it refers to. It is commonly recognised that treasury is associated with the word “cash”, which is generally true, in the sense that treasury management affects the cash position of the entity it relates with. But if we refer to a bank, where the core business is focused on cash, it becomes more difficult to identify the treasury boundaries. Then the first main question we want to provide an answer with is «What is the Treasury Function scope»? In a Product Industry sector, Treasury represents the core function to support the business life cycle, ensuring the required liquidity to run business in the short, medium and long term. At the same time, it sustains an effective liquidity management and assures an efficient use of cash in order to optimise the return on investment of the Company. It implies the need for structured planning and forecasting processes, cash management techniques and a strategic banking partnership which, together with structured analytics, can supports the Company through an effective and efficient financing structure and a return on liquidity aligned to the company growth strategy. 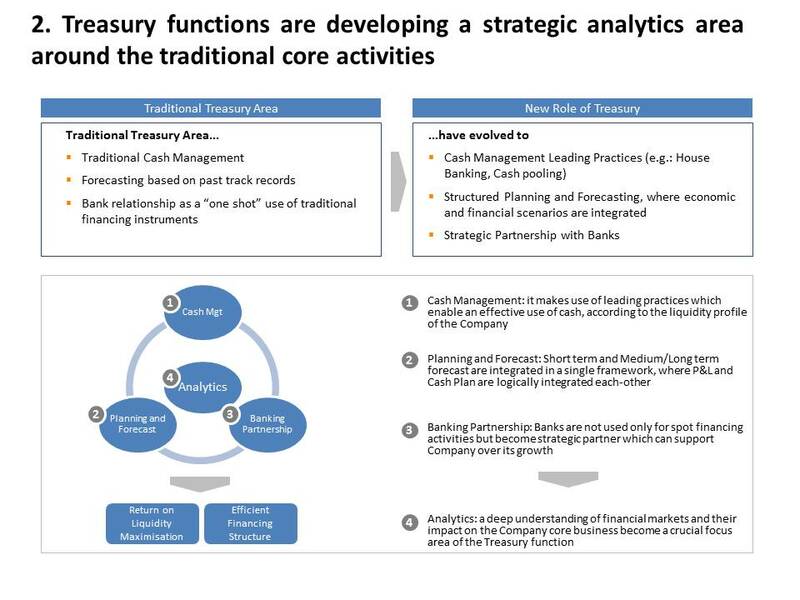 Treasury has seen a continuous evolution of its role, starting from a traditional concept of cash management as a cost activity centre of the Finance function. Then it moved to a value added centre concept as enhancing higher return on capital through an effective forecasting and planning function. 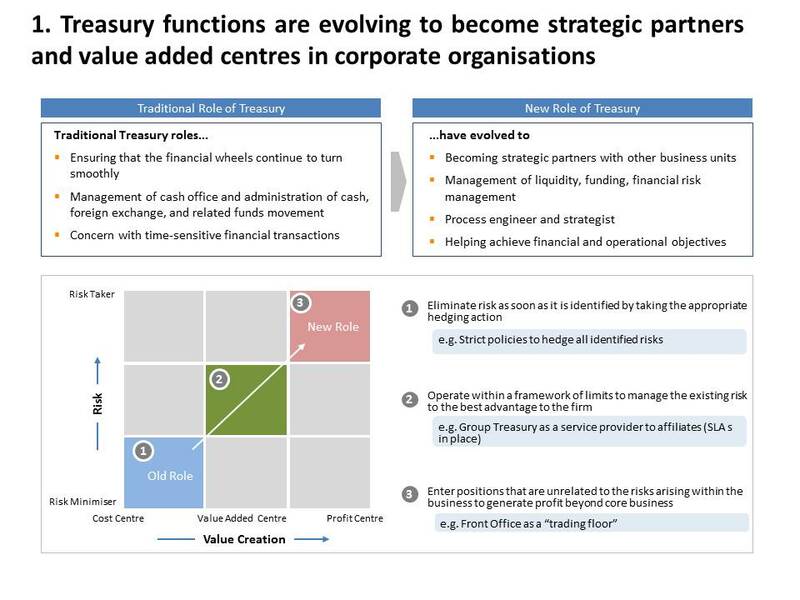 Finally Treasury has evolved towards a profit centre concept, playing a business partner role where a deep understanding of the financing market and conditions can proactively support the Company value creation. Commercial department, strategy, planning & control have then become Stakeholders of a strategic Treasury function, which at the end is supposed to support the core business sustainability. A similar evolution is occurring in Financial Services, where Treasury is becoming a crucial partner to make Banks successful in a challenging and stressed market, where the regulatory framework is becoming more and more a fast moving and complex change driver. 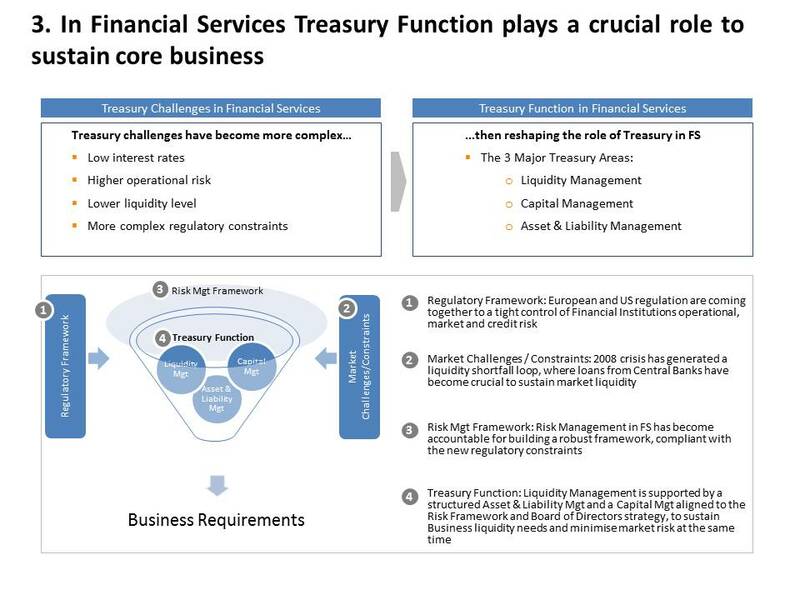 Historically Treasury has played a relevant role in the Financial Services sector since, as mentioned earlier, here the core business is represented by the optimisation of financial assets and Treasury is supposed to support it through an efficient liquidity management. In order to maximise the return on financial investments Treasury needs to provide cash at the right time and at a competitive cost. How much value Treasury can create for the Bank Organisation.